Bruce Levey Antique Auto Parts started out in 1994 with a small 5' X 8' trailer and a 10' X 10' spot at the Barrie Flea Market. In 1996 a 2,000 square foot warehouse was purchased and started operating as a storefront/warehouse. Today our booth at the Barrie Flea Market is 40' X 30' and we have a 20 foot vending trailer to serve your needs at the outdoor shows as well as another trailer for indoor shows and rolling storage. 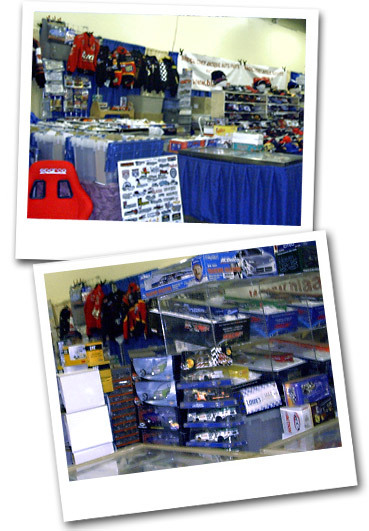 We have expanded from our namesake in Antique Auto Parts to one of the largest suppliers of NASCAR collectables in Canada. We have a long list of satisfied customers and have literally shipped items all over the world, including Great Britain, Mexico, USA, Australia and the Netherlands. If you lose track of us or can't find us on the web, see our ad in "Old Autos" the original Newspaper for the Auto Enthusiast in there business pages.